THIS COLOR CHART HAS BEEN PUT TOGETHER TO GIVE THE BREEDER INFORMATION ABOUT THE DIDFFERENT COLORS, AND PATTERNS ,THAT MAY BE FOUND IN THE FAINTING GOAT BREED. A BIG THANKS TO KW FARMS FOR SHARING SO MANY OF THEIR PICTURES WITH US. ALTHOUGH KW FARMS IS A NIGERAIN DWARF GOAT FARM, MANY OF THE SAME COLORS FOUND IN NIGERIANS CAN ALSO BE FOUND IN THE FAINTING GOATS. ,WE WOULD ALSO LIKE TO THANK ALL THE AFGO MEMBERS THAT HAVE SHARED PICTURES TO HELP WITH THIS PROJECT TOO! 7F RANCH SNOWBALL IS SOLID WHITE! and a few random white marks. His marks make a happy face! TITAN FARMS BETTY IS BLACK WITH A SMALL AMOUNT OF WHITE. SHE HAS LOTS OF SKIRTING ON THE BACK AND SOME ON THE FRONT. HER DAD HAS. NO IT IS NOT COPPER DEFICIENCY. Blue is a diluted Black. It often happens when a blue is bred to a black. Blue also happens from breeding 2 blues together. Chamoisee can be described as usually being tan or brown in color with solid black legs, underbelly and a stripe down the back. 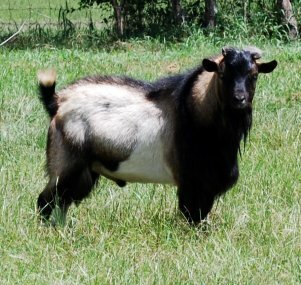 This, like the buckskin pattern, is pretty common in the fainting goat breed and also can come is a few different shades. Moon spots are irregular, somewhat round spots of color on top of the coat pattern. They are randomly placed on the coat and have no order or pattern. Moon spots vary in color from light creme to dark brown. They can come in many different colors, but will never be true white or black. The buckskin pattern has usually black that covers the head, neck, and shoulders in a cape effect with black on the topside of the tail, with the remainder of the body being a lighter color (brown/tan/creme/etc.) and the face and legs sporting coordinating stripes. Buckskin is a very common pattern in Nigerians and is easily passed on. There are several different shades of buckskin, but the pattern remains the same. The goat will have a white band going completely around their body. Sometimes it is narrow and other times it is quite wide. A tri-colored is simply 3 colors. Main 3 colors found are : black,brown and white. TRI-COLORED and Blue eyes. She is also a white polled. Roan is a mixture of white hairs found in any color base coat. This pattern has white ears, tail, and the lower face is usally white. The goat normally hs colored eye patches. Cou Blanc (coo blanc): Literally meaning “white neck”. A cou blanc will have white front quarters and black hind quarters with black or gray markings on the head. Cou Clair (coo clair): Literally meaning “clear neck.” A cou clair will have tan, saffron, off white, or shading to tray front quarters, with black hind quarters. A swiss marked goatwill have a mostly black or chocolate body with solid white, creme, or light tan legs, hind end, under the tail, on the ears, on the tip of the muzzle, and then matching stripes down the face to the muzzle; Some will also have a dot of white/creme on the side of each cheek. There are two colors to this pattern. You can have the more common black or the more unusual chocolate swiss marked. Ticking resembles pillow ticking. They are dark flecks. Wattles are a dominant hair-covered appendages. Seen in even some of the old Tn lines!! Not just a dairy trait. PICTURES OF WATTLES FURNISHED BY KW FARMS. SOME CALL THEM GOAT JEWERLY! Another great place to consider looking is at the link below. It is the suggested colors for the AGS. Although a dariy group the color suggestions are good!